400: Becoming Vegan / Vego: 3 Tips To Make It Easier On Yourself And Those Around You. In today’s show I’m sharing a few of the things I’d do differently as a new Vego or Vegan or I guess as someone embracing any new and significantly different approach to eating. Becoming Vegan / Vego: 3 Tips To Make It Easier On Yourself And Those Around You. You may know the old joke… Q. How do you know if someone is Vegan? A. They’ll tell you within a few minutes of meeting you. When I first became Vego I was absolutely ignorantly judgmental. To be fair, back then – at 16 – I was likely judgmental about many things not just the ethics of eating meat. I was also (as most teenagers are) hugely focused on ME. Now I realize non preachy is the way to get others onboard with something that is important to you. To quietly lead by example. To be a genuine model of the benefits to your approach to eating rather than a pushy sales person. 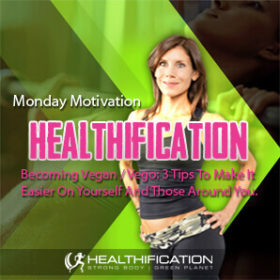 => To make Becoming Vegan / Vego Easier On Yourself And Those Around You: Be the Vegan / Vego you wish you met. For a start this is just going to be more fun as you won’t get the push back you might get if you succumb to preachy. You’ll also get less judgment reflected back at you. Perhaps even more importantly you’ll have a far better likelihood of being a positive influence so far as other peoples choices with regard to animal agriculture and trying a Vego / Vegan lifestyle. Two: Do Know Everything Counts. Everyone has to start somewhere. Q. How many new skills have new excelled at from the get go? Any significant chance to your eating is no different to acquiring a new skill. Except that when it comes to food we can be overly idealistic and expect ourselves to get it perfect from the start. The thing it’s important to acknowledge so far as your food is that – for most of us – food holds a huge emotional attachment. It’s addictive. It often serves as a vehicle to meet several of our 6 Core Needs. The 6 Core Needs are a Tony Robbins framework and I cover how they can relate to body gain (or lack there of!) in one of my most popular shows ever show #046. When a food item meets your need for Certainty, for Variety, for Connection and even for Significance such as say the family roast you cook each weekend might… then you’re not going to be able to go cold turkey giving up that food. You’ll need to find an alternative (be that a food or other more positive addiction) of equal need meeting worth. => To make Becoming Vegan / Vego Easier On Yourself And Those Around You: Be forgiving of your slip ups and also learn from them. Beyond your personal nutrition it’s important to appreciate that another person trying less meat yet not managing 100% Vego or Vegan is still a better outcome than another person not even trying. As such they deserve your support. Again, Be the Vegan / Vego you wish you met. That attitude creates an unwelcoming, unattainable, UNfun cult like perception of eating that no one will want to embrace. If you really care about the animals (!) then you’ll acknowledge it’s about a whole lot more than how perfect and beyond reproach YOU can manage to live. It’s about growing the movement. Making and keeping it more accessible to the non overly idealistic eater. Three: Don’t Be Scared Of Fat. It’s almost like fat needs to be renamed – what chance did it ever stand? First it gets to sound identical to the very thing very few of us want clinging to our bodies and second it got slammed with a hate campaign so formidable, pervasive and persistent it’s almost impressive. The campaign led by big food companies to demonize fat (and push their toxic, craving causing creations) would in fact be impressive if it hadn’t led to the worst epidemic of obesity and obesity related diseases the world has ever seen. 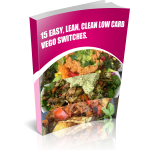 In the same way that as a new vegetarian you’ll quickly realize the need to be a lot less fussy so far as the veggies – herbs – spices you’ll eat… as a new vegan you’ll need to be a lot less fussy, less ultra extreme – or put another way a lot and more inclusive of good fat in your diet. Especially if your approach is primarily one ingredient high protein low carb vegan. Once you evict refined carbs and artificial rubbish from your routine then, you’ll by necessity find yourself turning to seeds, nuts and avocado that stack up – yet do not, I repeat DO NOT stack on (!) the fat. => To make Becoming Vegan / Vego Easier On Yourself And Those Around You: Think quality rather than calories. It’s really so much more HUGELY enjoyable that way anyway. A.bandon your scales and measuring devices. You’ll barely need them, especially if you’re as lazy in the kitchen as this little non-cook! In all seriousness though it’s zero fun being that person scrutinizing the deceptively misleading nutritional panels and serving sizes of processed-diet-calorie-restricted-Size-Restricted-JOY-RESTRICTED food. B.e ready for more energy, larger servings, less bloating, Less Cravings, LESS GUILT. C.ontrol your food and eat to live. Rather than being controlled by your food and living to eat. To get actionable today, as I hinted at the top of the show these 3 Tips To Make It Easier On Yourself And Those Around You relate to any nutritional upgrades you’re looking to make. Is there one that you could get better at? That’s todays action step. My biggest to work on is all of them (!) though if I had to choose, perhaps #One: Don’t Be Preachy! Although I try very hard not to preach I do have an impossibly expressive face and it has an annoying tendency to broadcast the thousand words I’m forcing my mouth to keep to itself! That’s it for me today. Healthification is proudly bought to you by The Strong Body Green Planet community – an online self-paced course, community and coaching program to Create A Fit, Lean, Healthy Body That’s Sustainable For You And The Planet. I’ve got your food and your exercise covered. I’ll tell you exactly what to eat, how to exercise and when… However, If your MIND is stuck you’re wasting your time moving your body. I’ll be back on Friday with the weekly wrap. If you liked this you’ll also like: 5 Common Mistakes Vegetarians Make For Fat Loss.